Janelle D. Milfred, age 49, of Wild Rose, WI passed away peacefully at home on February 10, 2019. Janelle was born May 26, 1969 in Madison, WI to the late Clarence and Ann (McCauley) Milfred. She attended special education classes in Oconomowoc, WI and in the Stevens Point School System until the age of 21. Janelle attended Community Industries for a several years, participated in Special Olympics, and enjoyed recreational activities. Survivors include her sister, Sherry (Ryan) LaForest of Shaker Heights, OH; brother, Christopher (Heather) Milfred of Nashville, TN; and nieces and nephews. She was preceded in death by her loving parents, Clarence and Ann. Thanks to the many people within the community and the wonderful staff at the Hidden Pines Adult Family Home who enabled Janelle to live a quality life despite her disabilities. 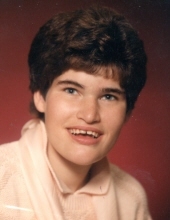 In lieu of flowers, the family requests donations to benefit the Hidden Pines Adult Family Home be made to the Janelle Milfred Memorial Fund; c/o Fifth Third Bank Legacy Village; 24261 Cedar Rd; Lyndhurst, OH 44124. To send flowers or a remembrance gift to the family of Janelle D. Milfred, please visit our Tribute Store. "Email Address" would like to share the life celebration of Janelle D. Milfred. Click on the "link" to go to share a favorite memory or leave a condolence message for the family.